Assess the efficiency of your waste and recycling program with just one look? Yes, it is possible. You can get an idea of what is happening by just glancing around you. Is your waste and recycling program optimized? Is it running as efficiently as it should be? Or are you paying too much and creating too much waste? Everyone can do this simple eyeball test. Go on. Take a look around you now. What do you see? 77% of what your business is throwing away is likely NOT trash at all. You are probably paying too much for waste disposal; and paying to throw away valuable, recyclable commodities. “The waste and recycling setup in a typical office consists of bins at each deskside. This traditional system is inefficient, but it is what people are familiar with, and what they see in many offices. So they don’t question it, and they may not even know that there is a better alternative,” says Great Forest CEO Ross Guberman. Conduct a waste audit. A waste audit will confirm your eyeball test with data you need to make informed decisions. 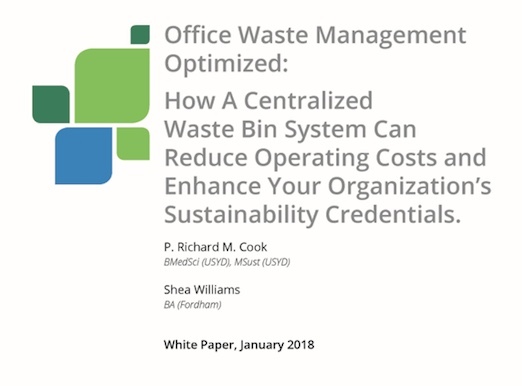 Learn about the future of office waste management. It’s the centralized waste bin system, and its simpler than you think. See for yourself. Download our white paper now. We’ve implemented the centralized waste bin system over the years with proven results that we are now sharing in our new free white paper. It includes cost breakdowns, benefits, misconceptions, and a case study. Get all the information you need to make an informed decision. Questions? Call your Great Forest representative today. This entry was posted in All and tagged White paper. Bookmark the permalink.